The foundation of GreenWood’s business success is our company commitment to creating a safe and healthy environment for our employees and customers. Safety is our first order of business in everything we do. 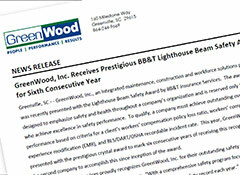 This commitment involves the total dedication by every GreenWood team member to ensure we operate in a safe workplace. We believe that all Health, Safety & Environmental (HS&E) incidents, injuries and illnesses can be prevented with proper proactive planning, employee training, constant awareness, diligent enforcement and genuine care. The employees at GreenWood know this and are fully committed to working safely and protecting the health, safety, and environment of others. To ensure this, each employee is provided with the knowledge and equipment needed to work within this framework as we follow our “Safety Ascension – Drive to Zero”. Participation in the HS&E program is not only expected, but recognized when projects and individuals achieve participation goals. 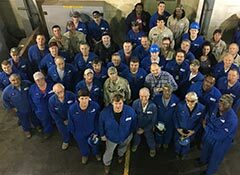 Incentive awards are given to encourage program participation and help everyone stay focused on the importance of maintaining a safe working environment. At GreenWood, safety is a priority in everything we do and it is the common thread woven through all levels of management and project personnel. Ultimately, our goal is zero incidents which means everyone must do their part to prevent incidents, accidents and injuries. To provide a visual for this ongoing commitment, our “Safety Ascension – Drive to Zero” illustration gives an instant view of our approach to work place safety. Each level within the illustration offers a purpose to reach our performance goals and commitment to continuous safety excellence. Foundation - It is the responsibility of GreenWood, our employees and our customers to promote a culture of safety. Doing so requires us to provide the proper tools, training and reinforcement to make safety a reality. By laying a solid foundation where we all understand that safety is our first priority, not just a slogan, we will be able to build an effective, team-based safety culture. Preparation - Before work begins, we must properly prepare for each job by understanding the environment we are working in, understanding the job requirements (PPE, Training, Tools, etc) and understanding the hazards associated with the job. The better we are prepared, the safer we will perform. Execution - During the execution of any task, it is the responsibility of each worker to be aware of their surroundings. Are we performing the task safely, with the proper PPE, Tools, Skills, etc.? Are we following the rules? Are we aware of our teammates? Are we having safety conversations when we see a risk? Secondly, it is the responsibility of GreenWood leadership to inspect the job site to ensure we are conforming to safe practices – “Jobsite audits” - and that our programs are meeting expectations. Results – The Drive to Zero is fully possible when we follow the stages outlined in the safety pyramid: First create a solid foundation of safety first; Next, review each job to understand the risks and take the necessary, proper precautions; Then, execute our work in a safe manner and be aware of our teammates and surroundings at all times; Finally, inspect what we expect and the desired results will be attainable. 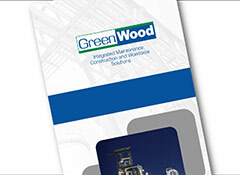 GreenWood’s ‘Safety Ascension – Drive to Zero’ is our cornerstone reference tool to ensure proper safety measures are being followed through all levels of work performed. GreenWood has an outstanding safety record that consistently trends well below the Incidence Rate of OSHA Recordable Cases and Lost Workday Cases based on national averages of the U.S. Bureau of Labor Statistics (BLS). Routinely, our projects reach key milestones in safety performance and are recognized for these achievements. We believe that employees who think safe…are safe! 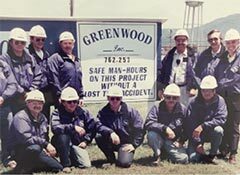 GreenWood maintains a stellar safety record with nearly 20,000,000 work hours. Several projects have never had a lost workday case and many have reached significant safety milestones totaling millions of work hours across multi-year, continuous work time frames.